Dom Pérignon was a Benedictine monk and cellar master in the 17th century. He is credited as being the “father” of Chamapagne thanks to his discovery that the wines in the his cellar started to bubble the Spring following vintage as the temperatures rose. Upon his discovery he exclaimed “Come quickly, I am tasting stars!”. In addition to this fortuitous discovery, he also was the first to blend grapes in order to improve wine quality and to make white wine from red grapes. He also started using a cork closure and thicker glass bottles so they would not explode under pressure. 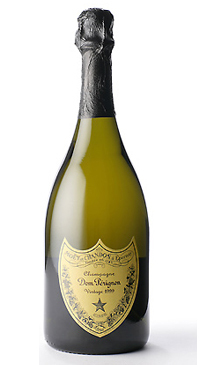 The Dom Perignon brand, which was first released in 1937 (1921 vintage), is owned by Moet Chandon. Dom is a blend of Chardonnay and Pinot Noir. In its youth it is smooth, creamy and balanced with lots of fruit. With time, it develops toasty mushroomy aromas and layers of complexity. It really is an impressive Champagne; arguably one of the best Grandes Marques out there.